from W. J. Popham (2008). Transformative Assessment, Ch. 1, Alexandria, VA. ASCD. Formative assessment occurs on an ongoing basis and provides information to the teacher that helps her adjust her teaching and lesson plans in the moment or in the near future. It is different from summative assessment, which measures a student’s performance and/or knowledge a few times a year, usually at the end of a marking period. Formative assessment enables a teacher to adjust her responses and instruction on an ongoing basis rather than waiting for the end of a marking period to respond in ways that would improve a child’s outcomes. 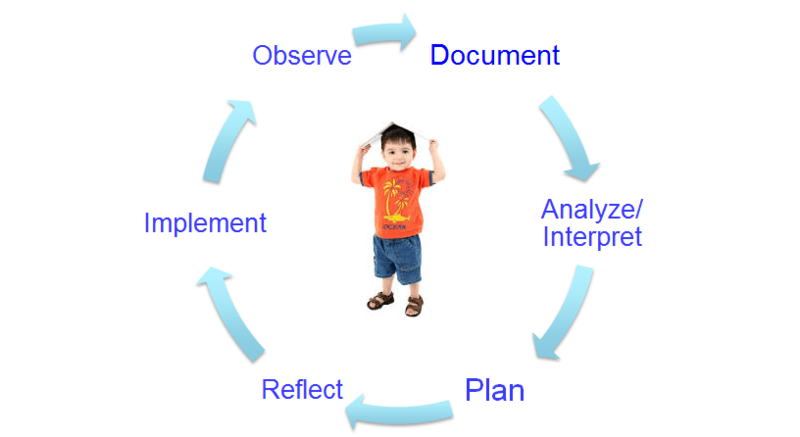 Formative assessment provides a window into what children know and can do, how they learn, and what interests them. This information enables educators to plan responsive learning experiences that motivate, challenge, and help children progress. To use formative assessment is to continually observe, document, and reflect, and then respond through interaction and additional learning experiences to advance children’s learning and development. Formative assessment is most effective when the teacher has a research-based, validated developmental framework or progression for organizing and using the information gathered through observation. Having a continuum of learning, or a framework of development, is valuable for identifying what the next steps are in the child’s learning, and in what ways the teacher can help the child grow. . . .Teachers need to have in mind a continuum of how learning develops in any particular knowledge domain so that they are able to locate students’ current learning status and decide on pedagogical action to move students’ learning forward. Learning progressions that clearly articulate a progression of learning in a domain can provide the big picture of what is to be learned, support instructional planning, and act as a touchstone for formative assessment. Why has Massachusetts stressed observation for assessing young children? To understand why a teacher’s observations are such a valuable part of assessment and teaching, we need to think about the nature of young children’s development and learning. We know that all domains of children’s learning are important and that they are inter-related. We know that the richest, most accurate picture of young children’s development and learning is captured through observing them engaged in authentic activities with familiar peers and adults. Testing often removes a child from a familiar environment and is focused on one aspect of a child’s development and learning, so is not likely to produce a full picture of what the child knows and can do. Much research has shown that a key factor in young children’s learning is the quality of the teacher/child interaction. Teachers naturally observe children while interacting with them. Observing a child with intention enables the teacher to know the child better, and this in turn greatly improves the quality of the interactions she or he can have with the child. The rate at which young children develop and grow varies widely among children. It is not uncommon for an individual child to be more advanced in certain areas of development than others. Observing the child in all areas of development gives a fuller, more balanced view of the child’s strengths and of all areas that need to be addressed. Also, assessing the whole child through observation illuminates how development in one domain influences development in other domains. For example, much research has shown that a child’s social-emotional and cognitive development is a key predictor of academic and lifelong success. Since teachers can foster social-emotional and cognitive development in children through their teaching, it is crucial to assess these areas through observation and to support these areas of children’s development.